Live your best life with this time-saving tip—no peeler required. We’re in the height of summer now—which means picnics, barbecues and all manner of excuses to eat and drink outside. And, at least for this root-vegetable-loving writer, no summertime cookout is complete without a good old-fashioned potato salad. There’s something inherently summery about this potluck staple; versatile, nostalgic, substantial but not too heavy for hot weather. Personally, I like potato skins—but there are plenty of people in the peeled-potato camp, and that makes what should be an easy-breezy summer salad a little more labor intensive. 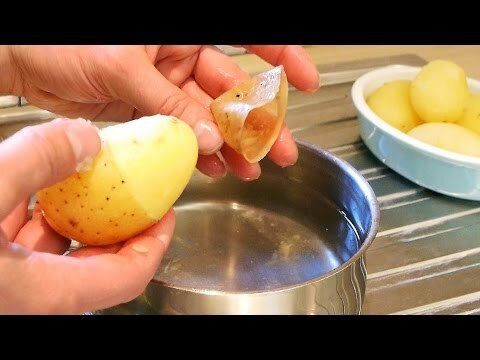 As anyone whose grandmother has enlisted them for help in the kitchen can attest, peeling potatoes is, in fact, the worst. And that’s true year-round. Looking for ways to apply your newfound potato skills? Check out our recipes for mashed potatoes, shepherd’s pies and gnocchi. And, of course, the possibilities are endless with potato salad.